Painting windows sounds easy and no one thinks about color placement mistakes. But I have seen color placement mistakes on old wood windows and also on new historic replacement windows. 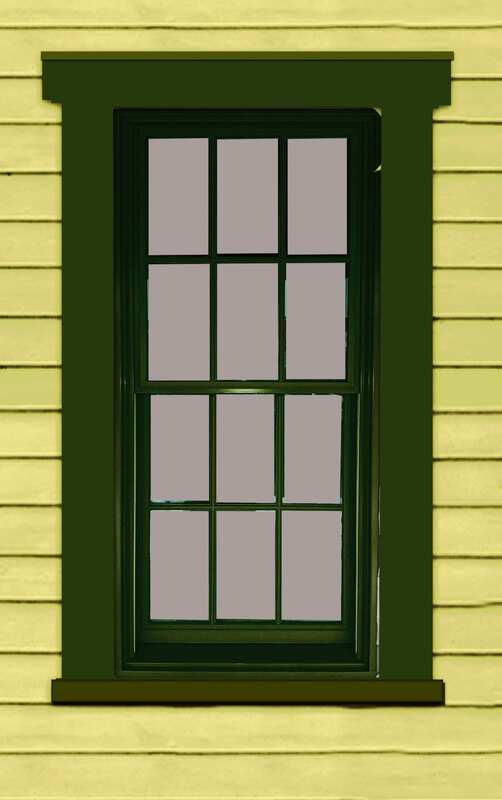 To understand color placement when painting windows you need to understand window design. This may seem pretty basic at first but it becomes more involved with replacement windows. Incorrect color placement on your windows will have a negative effect on the appearance of your house. Read on and you will see what I mean. Basically you have two options when painting windows: paint your windows one color or paint them two colors. Painting windows two colors allows your windows to pop like eyeliner on a woman’s eyes. This is important since windows are a character-defining feature on a building. Therefore. your window’s appearance should be a priority. However, when painting windows using two colors, you need to better understand the parts of the window and know what to watch out for. Once you learn, you will be able to avoid color placement mistakes that could make your house look bad. Proportion is extremely important for every structure. Proper proportion is what makes traditional architecture look strong and pleasing to the eye. Color placement mistakes when painting windows can alter the effect of proportion making the structural appearance weak as if wood trim were missing. To avoid painting mistakes you must first understand your window. A window is composed of two basic parts. The Window Casing and the Window Sash. Window Sash is removed from Window Casing. In the image above the window sash is removed from the window casing. The window casing – the pretty frame that holds in the window sash. The casing is stationary and considered Trim on a house. The window sash – the window part that moves up and down and fits inside the casing. When the window sash is removed, the window casing is just framing an opening to see inside the house. 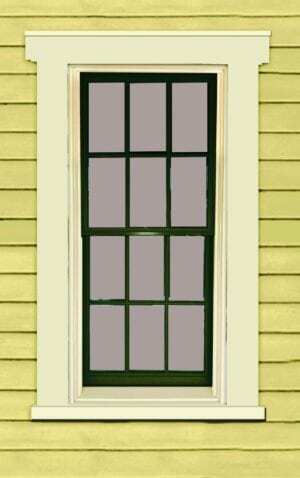 When painting your windows two colors, paint the window casing one color and the window sash the other color. Sounds simple right? Then why do so many people do it wrong? Let’s look at this a little closer. This window is painted correctly. In this example the entire window casing is painted the contrasting color red. This is how it should be painted. The window sashes are one color and the casing is another color. The casing is larger, has more surface area and therefore appears strong. One common mistake is painting the face of the casing one color and the inside of the casing the sash color. This is wrong! Painting the sash AND the inside of the casing the same color makes the sash appear larger and heavy looking. Instead, the sash should appear more delicate and the casing larger and stronger. Do you see how the red casing lacks support and appears weaker just because of how it’s painted? Note: In the casing there are channels holding the top and bottom window sash, allowing them to slide up and down (open and close). Most channels have been painted many times over the years, which results in paint build-up and difficulty opening windows. Stripping the paint is best if your windows are hard to open. If your windows open fine and you are changing colors, only apply a thin coat of paint. Following these instructions may be simple for an old window but new windows are designed differently resulting in a not only wrong, but stupid look when painted. You have a window sash and a window casing that holds in the sash. There is no need for it to be complicated. Both sash and casing must be sized proportionally to make a visually pleasing impact on a building. The window casing must show strong structure because it supports an opening in the wall of the house. The window sash is more delicate and secondary to the casing. It should be strong enough appearing to be visible from afar and show enough strength to hold the window glass firmly. Window Manufacturers Design New Windows Wrong! We showed you an example above of what to do and not to do when you are painting your windows. Here’s an example of what NOT to buy since the manufacturer is the one making mistakes. The first mistake was for the homeowner to buy a new replacement window! The homeowner selected nice colors but as you see the window manufacturer does not understand window design. New windows are now designed with an extra trim. 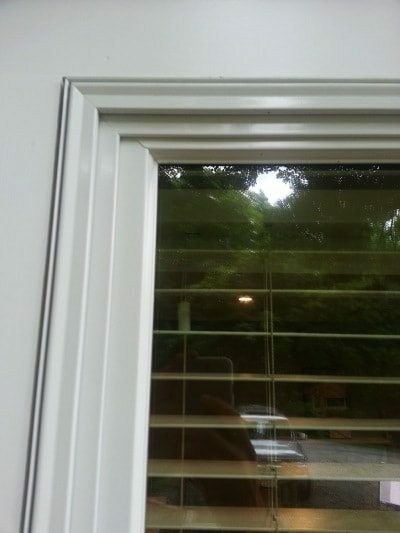 Manufacturers may believe that this extra trim makes the window look fancier. They may convince the buyer that it is more elegant. The fact is that this extra trim overlaps and conflicts with the structural appearance of the window sash. Instead of a crisp transition, with a nice shadow lines between the casing and sash, there is now a new molding muddling the traditional look. First let me say we are discussing the inside jamb part of the window casing. This window example is full of other design errors that we will not go into. To understand more about window design, click here. In the example to the right, see the red window sash. Now see the extra red trim on the inside of the window casing surrounding the window sash. This extra red trim makes the sash appear heavier and the casing weaker. This is the opposite of how it should appear. There is also a fake sill that is painted the same color as the sash. Instead of a crisp strong look, it is muddled, unbalanced, and out of proportion. Here is another example. The image on the right was corrected graphically and it looks better. 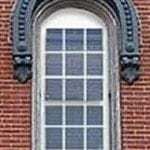 See how the window casing appears weaker and the sash appears stronger in the bad version? 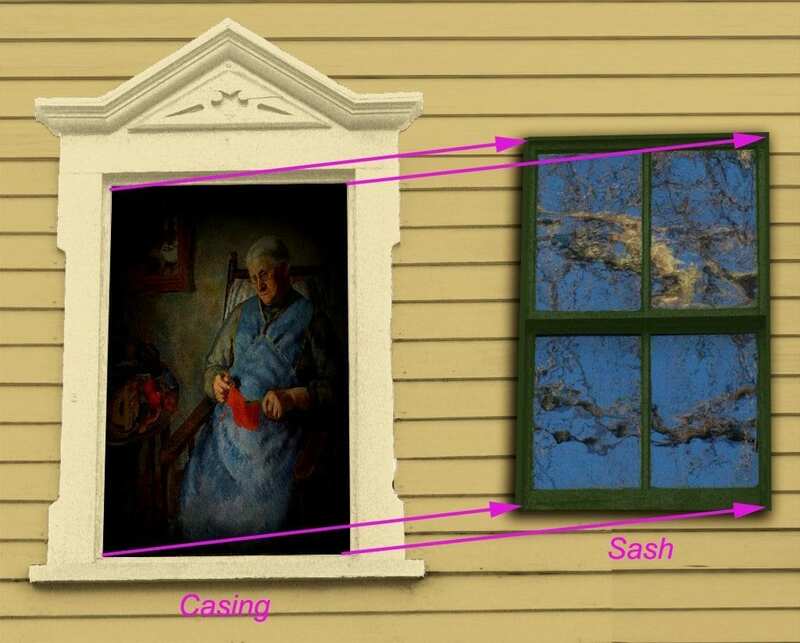 -See how the window casing appears stronger and the sash appears weaker in the correct version? So why not paint that trim yourself and your investment will be not be lost? Yes, you can do that and it will look better. But it still will not have the effect or be as good as the traditional window we all know for older window sashes are a bit wider. Additionally this trim is attached to the jamb part of the window casing and houses the tracks the window opens and closes in. It can be painted of course but I would not recommend it. The next example illustrates another problem. 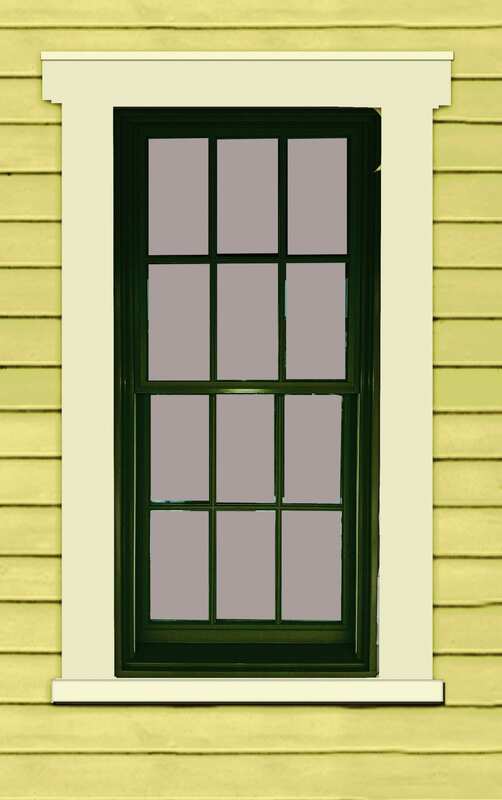 This example shows a window casing and sash both the same color. Color placement does not come into play here but other issues do. 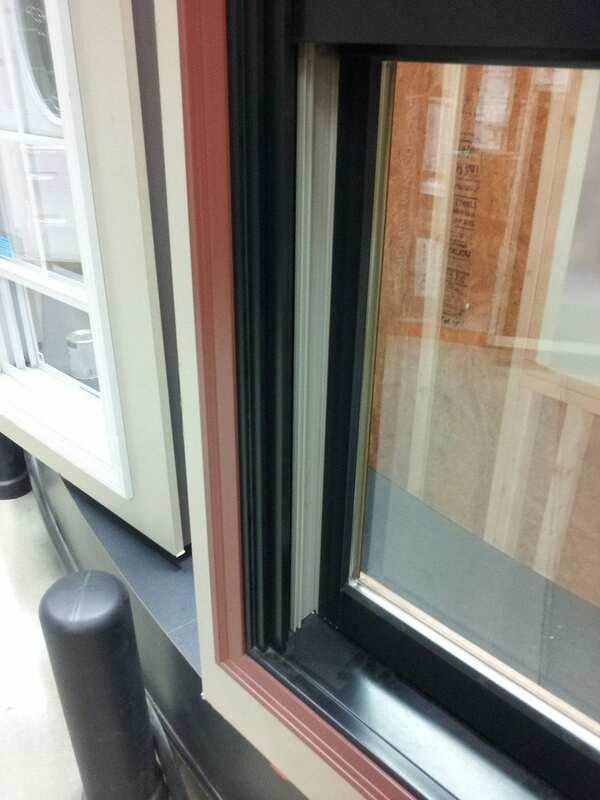 This is a top of the line Pella wood window with clad aluminum on the exterior. The extra trim on the inside of the casing is less obtrusive since it is not painted in a contrasting color as the other examples. Unfortunately a problem still exists. With this extra piece of trim you don’t have a sharp shadow line where the casing should have an edge. Shadow lines are what brings buildings to life. This is an expensive window made to “accurately” copy a historic window. It fails at that. If you go to the Pella website they show many top of the line windows but only images of the interior, not the exterior. This really is a problem – how would they know what the windows will look like from the outside based on this? A homeowner can buy a nice wood window based on what they see on the inside and assume the exterior is like a normal everyday window. Just because it’s Pella, doesn’t mean you’re safe. Most people wouldn’t think they’d be installing new windows that could have such as drastic impact on the appearance of your house. They might be surprised when these windows are installed. Maybe they don’t notice – but they should if they care about their house and their investment. Without the sharp definition of a traditional window it looks sloppy. The salesperson may say this resembles fancy molding. Please understand that molding is designed based on classic rules of architecture. A baseboard molding has its roots in ancient Greek temple design. This is not a place for “artistic license”. If this homeowner wanted to paint his window sash a contrasting color he would not be able to do so. With this design the sash would be too thin. There is not enough visible sash for a contrasting color – it will not be noticed. window sash is painted but is partially blocked by trim. Notice how the extra trim creates a sloppy look. The painted sash is so thin it is hardly noticeable. Replacement windows today are “maintenance free” – meaning they cannot be maintained! These windows are self-contained systems. If there is a problem, they are designed to be removed intact. trashed, and replaced again! All hope is not lost for in 15-20 years the windows will have to be replaced and a new more realistic design may be available. Home Depot window display. Go see the problem in person. Here is a display from Home Depot. The age-old design of the window casing showing strength to the subconscious mind is now reversed to show the window sash to be stronger than what supports it. The average homeowner is not a window specialist. They/we are at the mercy of trained sales-people. If your goal is to save energy with new windows, you’ve been hoodwinked. That is just a scam to perpetuate window sales. Read the truth about windows here. A homeowner orders Anderson 400 series replacement windows. 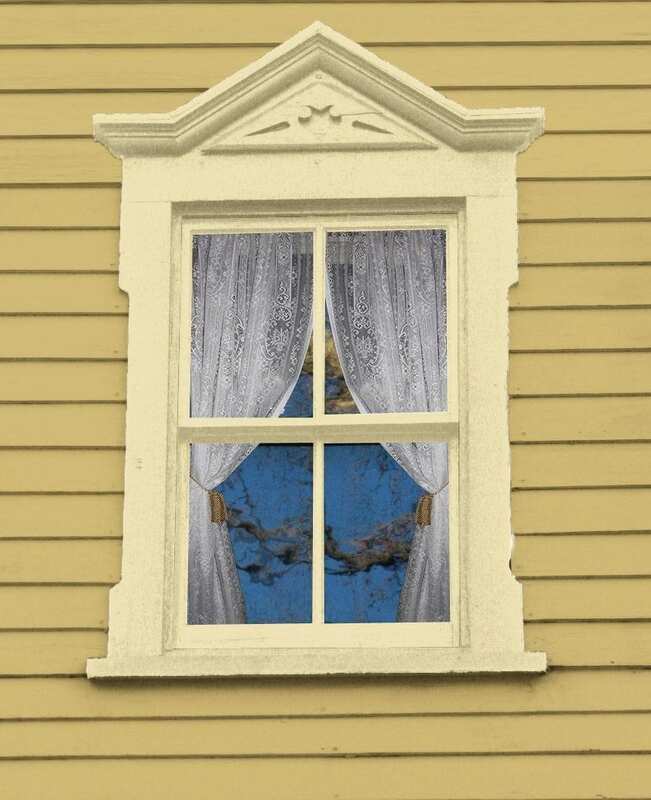 They order green windows because the green window sash would look nice with a white trim and yellow clapboard. 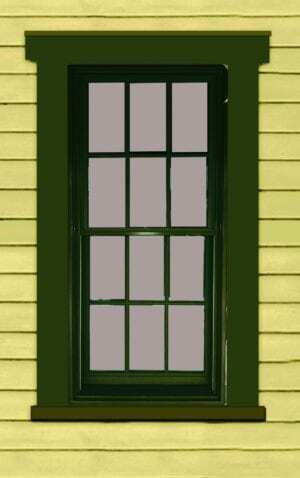 From the 1840’s to 1940’s a popular window sash color was dark green. When used on a light color house this splash of color adds a nice accent effect without competing with the other colors. The average homeowner assumes they will be getting a replacement for what they have. Who would think there are so many design issues to be aware of. Energy efficiency is complicated enough! When the salesman explained everything it all sounded great. The homeowner was just looking forward to some nice color combinations on their house. When the windows came in they received the upper and lower window sashes combined into a single window unit. Both window sashes were green like they wanted but the entire window unit which includes the jambs were also green on the exterior. Anderson 400 replacement window unit. In this image the Anderson 400 window unit is installed. As you see the jamb part of the window unit is visually part of the window casing and should therefore be painted the window casing color which is white. When looking at this window at an angle the jamb is visible and you can see there is too much green. The window therefore appears heavier. Installed Anderson 400 window unit. The homeowner has two options to correct this problem. One option shown to the right is to paint the jamb part of the Anderson window unit to match the casing. This is how a window should appear. The problem is that with this design the sash part is very weak looking. Another problem is that you are painting the jamb which contains the slider tracks for the windows to open. I really don’t recommend messing with this for you may hinder operation of the window. Anderson 400 window is painted to correct a bad design. 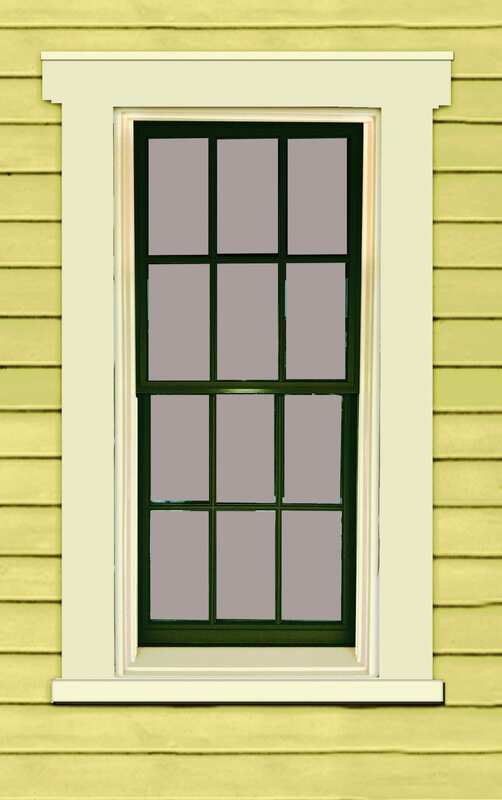 The second option is to paint your trim to match the window as in this image. This is not exactly what the homeowner had hoped for but this is the best option for a window designed in this way. Green window casing to match Anderson window. If you must purchase a window similar to my examples, to get the best look on your house you must purchase a window in the color you want for the trim on your entire house. This way you won’t have to paint a complicated jamb with window channels. To let your friends know about painting windows correctly, I have created an Infographic. It only covers the basics and hopefully will lead readers to this page for details. 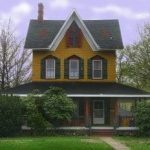 My hope is for homeowners to understand what they are buying and the impact it has on curb appeal. Here it is – I hope this helped you. Please share it on your favorite social media site and help improve curb appeal! 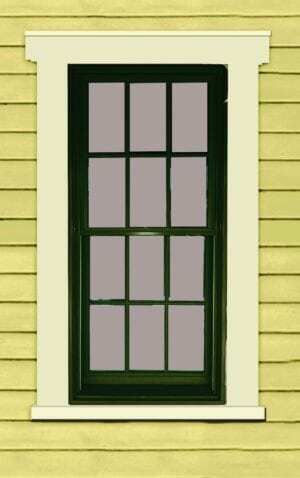 What About Storm Window Color? 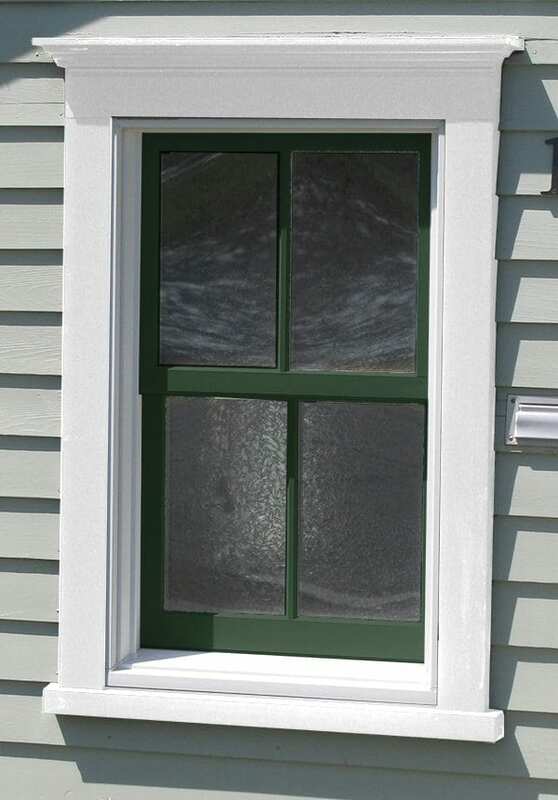 Storm windows must match your exterior window sash color. Remember Old House Guy offers a virtual house painting service . We will make sure your house is painted correctly and no mistakes are made. Homeowners Finally Discover Replacement Windows were a Mistake! Enjoyed reading your appreciation for windows. I have always thought the same windows=eyes, door=mouth. Struggling with windows on a 50’s ranch and found you. Hi OHG, you have been so helpful in my home renovation project! I wish I had found you earlier. My pella architect series windows are in (new construction), having been chosen for the “true divided light” look. I love the exterior muntins, but have been irritated by something wrong. Sure enough you covered it here. It’s that extra trim, which makes them look like replacement windows. This is infuriating. I can’t wait to be able to paint the trim to reduce the contrast (slightly different whites), but I know now that it may always bother me! I at least feel better knowing that I’m not crazy. Thanks for fighting the good fight. Do you take on fake wood grain in places where real wood would be milled smooth-a huge pet peeve of mine, with pella doors being a big offender! Thanks for your comment. I wish I could have stopped you sooner! About the fake grain – how stupid do manufacturers think we are? I did write about this on my porch skirt page where to make lattice a sheet of plastic has holes punched into it with fake wood grain to fool us. We are planning on winterizing the left half of the porch to gain a much needed 3rd bedroom and entryway. The right side will have to remain 3 season as it is for now. My question is what type of windows should I use in the new bedroom, and what should I do about the front door that now needs to go back to a single door to allow enough room for the bedroom? Remodeling the entire porch is not financially possible. We would appreciate any thoughts you have. I realize I need to send pictures, I’m trying to figure out how to do that. Excellent discussion of windows/trim. Redoing an 1832 Greek Revival and want to do black windows. Your site is a phenominal resource. I need to replace several windows on our late 1800’s farmhouse that were installed by the previous owner during his 1960’s “remuddling” job (as OHJ puts it). I’m now convinced that I don’t need to spend tons of money on expensive, architecturally incorrect 20 year windows. I’m going with wood windows, probably from BROSCO. I am getting replacement windows and want them to be black sashes on the outside, yes they define the windows and make them look crisp. It in the details that makes the difference. Fantastic article– I definitely tweeted it! Another big problem I caution clients about it the mess that can often be created (especially with many layered of paint that haven’t been stripped) of painting a dark color on the exterior sash and a different lighter color on the interior. Often very hard to get a clean line– with the messy break/line being visible from the interior. Any suggestions on how to remedy this, other than very careful prep and painting? This was very helpful and helped focus my eye on proportion and shape. I have a question: Is there ever a time that the color of the mullions would be different from the color of the sash? We live in a hi-rise apartment building (so the outside appearance is of no consequence and cannot be altered). We’re just concerned about appearance from the inside. We have aluminum windows that have a crank handle and open inward in oil rubbed bronze color. Our apartment is antique farmhouse style and I began working on the windows to improve their inside appearance to the extent possible. First, I built very nice white casing all around the windows where there was none. It is white, to match other extensive molding in the home. Where there was excessive sash as in some of your pictures, I did an overlay of white molding to further add weight to the casing and reduce the bronze part. Now I have inserted window grills. So white casing and bronze sash. Before painting the mullions bronze, I primed them white and did a size check and was surprised that the white actually looked very bright and nice. If I could, I’d have the entire thing white, but I am not allowed to paint the bronze aluminum. So before I continue and paint the mullions bronze to match the sash, is there ever a case where you could have the casing white, sash bronze, and mullions white? Or do the mullions have to be the same color as the sash? Sorry, I meant muntins, not mullions. I am asking about the paint color of the window grills, i.e., muntins. Hi – sorry – the sash and muntins must be the same color. Thank you, I thought as much, but wanted to check. I used your painting tutorial as the reason for applying molding over some of the sash to minimize it and increase the casing and it was an amazing difference. Thank you so much. What is the best way to paint Pella windows? The salesman said we needed to hire a car body repairman to come and rough the windows up before repainting them with Pella paints. Is this necessary? That sounds crazy. Most manufacturers will advise against painting vinyl/plastic because unless they are already a dark color, painting white windows a dark color can cause the heat from the sun to warp them. This is what they say. However, left by a previous owner, I have a vinyl window in my attic that was white and I painted dark green. It has not warped and gets full sun. I can’t advise you to take that chance though. However most paint manufacturers (Benjamin Moore etc) carry dark paint for this purpose with reflective properties you can use that will not heat up. Before you do that the glossy surface needs to be buffed up with one of those steel wool pads as any glossy surface would. I love your article and found it just in time. I have been agonizing over window selection for updating windows on my house. 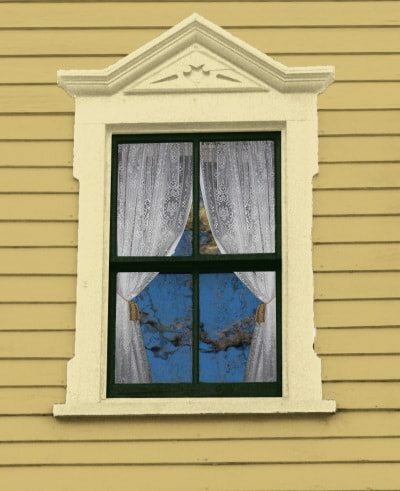 I am looking at Andersen A Series windows and considering a different color for the sash. Their catalog shows the sash and the parting stop, sash channel and blind stop painted the same contrast (darker) color; with a different (lighter) color on the trim. I understand you consider this wrong. Is it also a mistake to have just the sash in a contrasting color. Will the window appear too weak? In other words, is the only good option you would advise to go with just one color? No contrast. They also offer a three color choice. 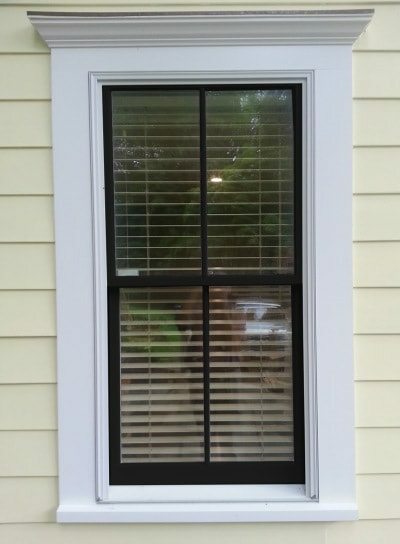 Sash in one color (darkest), the parting stop, sash channel and blind stop in a second color, and the trim in a third color. What do you think of this option? As the article states. There are two components the casing and the sash. Each can be painted its own color. The blind stop etc which are part of the casing are part of the casing and it would be crazy to paint them a different color. It’s just plain and simple. And what color should the storm windows be? We are painting now, and are painting the windows casing cream, and the sash will be black. We are also purchasing new storm windows for increased efficiency. Should the storm window be cream, or black? Storm windows must match the window sash. How about window screens (in California), same principle? The screen frames should match the window sash? Awesome site! This helped us decide to keep our 80 year old true divided light windows. Love the colouring tips. Our interior trim and sashes will be painted dove white. The exterior will be painted a grey colour. The question for you is what colour should the storm window side facing the interior be painted? Should it be grey (matching the rest of the exterior paint colour for the sash and trim) or should it be dove white (because it faces the interior and therefore matches the interior colour scheme)? Saving your window – great news! 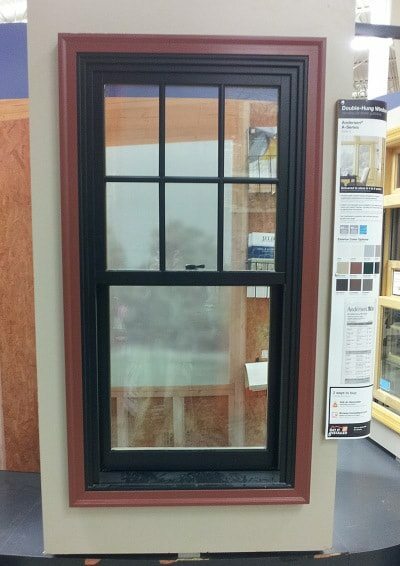 The entire storm window will match the window sash. Good luck! What do you do when the interior trim on our tudor is white and the exterior is brown? The windows need replacing and they are currently white anderson casement with the cross bars (all white in and out). It works for the inside but isn’t ideal for the dark brown trim and beige exterior of the house. I can’t decide if I get the brown windows to match the outside or white to match the inside. Hi Patti. If your window trim is white on the interior, keep them white but on the exterior they should be tan, dark brown, or black. Actually black windows look great on a Tudor. The big problem comes in with bad windows. You need to have True Divided Light windows so they can be painted the correct way. The cross bars (muntins) must hold the glass and be on both the inside and outside. Anderson is not that advanced for they think homeowners do not know any better. LOVE this site. We have a rough stucco 1924 American Foursquare with the original aqua-colored exterior body paint! I’m absolutely keeping our wavy glass windows, which are set in deep exterior walls. This year, we plan to take each window, one at a time, and strip, re-caulk, and paint each one. I have been agonizing for several years over colors and storm windows – exterior (flush) or interior – as well the colors themselves. I’d been thinking about a medium gray with greenish undertones for the body, a tan for the casing, and dark bronze for the sashes and muntins. I’ve seen photos of windows whose exterior edges were painted the same color as the sashes. Any comments and guidance to help end my uncertainty would be truly appreciated. Thanks for all. I would suggest black or red for the sash. We have just reglazed all our sash windows, managing to save much of the original glass. Looking at painting the sash a dark blue grey on the outside but wondering if it is suitable to have the inside and outside of the sash different colours? The house is white on the outside and we will do interior trim white Dove with finish plaster walls. I’m uncertain about a dark sash from the inside, so thinking about painting them the same colour inside as the interior trim. As stated earlier, the inside sash must match the interior wood. Dear Ken: Thank you so much for your website. What a wonderful source of info. I wish I had done my homework. We are currently adding a “carriage house” above our old garage. Our house is a 1920’s colonial style house in St. Pete FL. We wanted to match the painting and trim style of our main house (white with grey blue trim casing which frames all 4 sides of each window) but the contractor ended up putting in the new windows differently than we had expected. There is casing around the sides and bottom of each window but the top casing is part of a band which continues around the building. This is done upstairs and downstairs. I don’t know what you call the style he has used. He claims it’s historically appropriate (although we had no idea he was going to put in the windows this way). We assumed each window would be framed as the windows of the main house (casing which frames each separate window on all four sides). We’re not sure how to paint the house now. We had hoped to keep both buildings white with colored trim but now we have to deal with two bands going around the top of each story of the new building and think it might not look right to have these bands anything other than white which means we have to rethink our color scheme. Any suggestions? My house is a 1920 bungalow with the original wood sash windows. Most are painted shut and are white on the exterior. I really would like to have the exterior painted black, but the original storm windows were replaced by white aluminum storms. All the windows casings are wrapped in white aluminum. To achieve the black window trim I’m looking for, would it be enough to just paint the white aluminum windows black? And if so, what is the proper way to paint them so the paint adhere and be long lasting? Or should the window sashes be painted black plus the aluminum windows? Just paint aluminum as you would paint wood – actually it’s easier. Your storm window and sash must be the same color. I am having trouble finding examples and advise when painting window sashes and casing/trim as well as the wood shutters. Do shutters usually match the widow sash color or the casing or are they third or forth color (including the siding color). Great question. 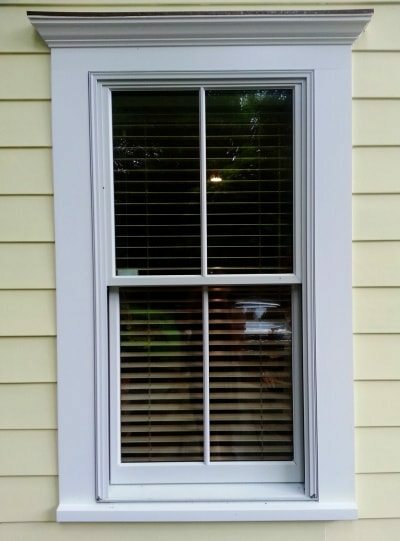 In most cases where the window sash is a color other than white, the shutter will most likely match. This does not have to be though. If the house has a white window sash then the shutters would usually be an accent color. With a body color, trim color, and a sash color, the shutters would either be the sash color or a fourth accent color. Quick question.. how do you handle the aluminum storm window frame? We have white (interior) plantation shutters, poorly painted white exterior casing, storm windows without paint, and the sashes are still natural. Over time we plan to restore each window as they still work great and are way better than any replacement. Red brick exterior with navy exterior shutters. Thanks! …and I should have mentioned the windows are a combination of paned and picture. 1950s cape cod. I’m guessing the plantation shutters were not the best choice looking from the outside but that’s okay. love them from the inside.. Now just stuck on how to handle the exterior. Great site btw! Thanks in advance! The storm window matches the window sash on the exterior. We purchased Jeldwen wood clad floor length window which does not open or close. The clad on the exterior is black and we really did not like it and want it to be white. What type paint is best to use for it although they do not recommend painting it? Only if the window is plastic you need a special paint so you can use just regular exterior paint in gloss. I’m so glad I found your website! My wife and I are renovating our 1937 craftsman style house and went with Anderson 400 Series Woodwright windows with the Anderson white exterior sash/casing and white 3.5″ flat trim with sill nose. With how renovation schedule and timelines are, we had to pick the windows way before we really thought hard about the paint. Now that we are near the end of the renovation, we need to make a decision about the exterior paint colors and are thinking about painting the window sashes a different color. My question is: Do you have the same recommendation (of not painting the sash a different color as the trim) for the Woodwright 400 series as you recommend above for the regular Anderson 400 series? My understanding is that the Woodwright has a thicker sash and a more historic look than the regular 400 series. Would the Woodwright series have the same issues with the sash looking weaker / too thin? I do not recommend the Anderson 400. For one the casing is only 3.5″ As for your question, if it were me, I would paint the sash a different color. As for the Woodwright being thicker, I have not researched that. Thanks. However, I’m now confused about your comment on the 3.5″ casing. We chose the 3.5″ flat casing to match our original casing which was 3.5″ flat. The Woodwright windows match our original windows so well that a lay person would be hard pressed to point out the difference between the two even with side by side pictures. What casing would you have gone with? I spoke with our painter after my original comment and he is suggesting not painting the sash for two reasons 1) the dark paint may warp the window, 2) we’d end up needing to repaint them sooner than if we left them the factory white due to UV bleaching. Are those valid concerns when painting the sash a darker color? I’m surprised it it 3.5. That’s on the narrow side for most windows are 4- 4.5 inches. As long as it matches is what is important. Manufacturers do say that dark paint can warp a plastic window. That is why I encourage people to order their windows pre-painted. However all paint stores carry a special paint for vinyl that has reflective properties in it. In this case you can use black paint on a white window. As far as having to paint them sooner I would say you should get 10-15 years with the paint. 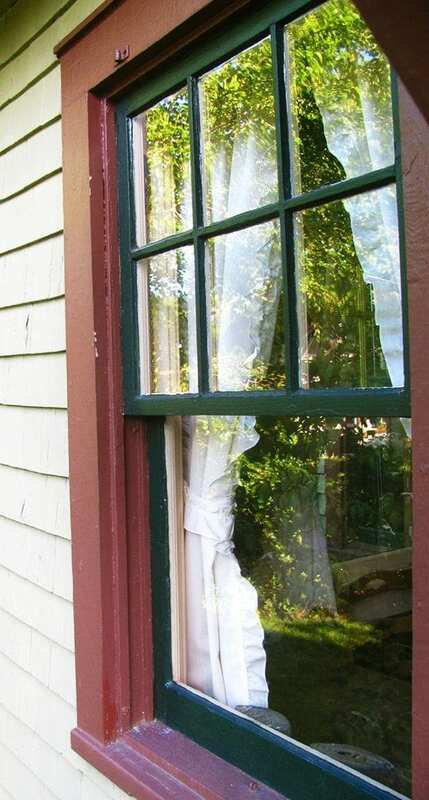 Keeping the original windows or ordering wood windows would avoid these problems. I just realized that we actually went with 4.5″ casings. Not sure why I thought they were 3.5″! Should we try to find a color close to the color of the brown Anderson window to repaint the casing? We will be hanging bahama shutters over the windows. They are handmade cypress. We wanted to stain them with a semi transparent stain. Should we try to find a stain in the same color family as the sash color (trying to camoflage our window mistake) or just stain them a nice natural looking color to match the front cypress door? If you could simple tell us what you suggest for this whole window area, you would be my hero. And, I thank you so very much. 1) paint your window casing along with all the trim to match your brown window sash color. As for your shutters, I would paint them to match the brown window sash and I would paint the front door the same color. Do you have any thoughts or experience painting the exterior of Fibermat sashes of Anderson Windows. I will be replacing all the windows in a beautiful Victorian and the sashes must be a Rock Red color which is not available in Anderson’s insert replacement window lines. I have been around for a long time. It is a pleasure to come across someone that understands and uses the terminology correctly and has an eye for good and appropriate design. Your beautiful Victorian will not be beautiful anymore with Anderson windows. Why would you do such a thing? We have 35 year old casement Anderson wood Windows. I want to paint exterior from white to tan. They are vinyl coated. If I replaced the weather stripping then painted the trim would this work? What era would use Black Sash Windows in a White Frame? Incredibly succinct, and helpful write-up! Planning on painting the windows, storms, and trim of an un-remodeled mid-century ranch; and now I feel confident it will look good when I’m done! This is so helpful. I am purchasing new windows to be installed in the next couple of weeks with new siding and roof. Very helpful article! I am replacing aluminum replacement windows with wood sashes, installing Acme balances etc. Problem is the interior is all stained wood, but the exterior is white. So what gets white and what gets stain? Should I just paint white the whole casement? Sill, sides and top? That seems wrong…maybe stain the interior parting stop channel, but paint the exterior parting stop channel? Curious if you have encountered this problem before. Hi Ben – don’t paint the sides of the window sash. You want them to be able to slide in the channel paint free. I would only apply stain to the sides. The best way would be to keep all channels interior and exterior stained and apply linseed oil. This way the wood will be protected and your windows will slide nicely without any paint. Hope this makes sense. thank you – i’ve learned so much! i am replacing the jalousie windows that were put into my 1924 craftsman bungalow with what was in there originally – wooden double hung windows, one or two at a time. i’m a first-time home owner, and my question is similar to ken’s: where does the interior paint color stop and the exterior paint color start? the interior sash and trim will be a variation on white, the outside sash will be brown, and the outside trim will be another color. i can apply linseed oil to the sash channels as you recommend above to protect them without painting them. maybe the parting stop should get this treatment as well. do the tops and bottoms of the sashes get painted the inside color? then maybe the exterior color starts with the blind stop? the interior-facing side of the blind stop as well, even though it’s only visible from the inside? If the window jamb is painted then it should be the exterior trim color if it is facing the exterior. If it is not painted then the blind stop should be the division line between the oiled wood and the painted wood. We have a mid century style ranch home built in 1952. We have sandstone for much of the siding but not all. The living room window is HUGE, as are two windows on back of the house. All the bedroom windows are big and long. Currently there is a cream color exterior, with dark brown trim. The living room window is made up of 4 different size panes with wood trim outlining the panes. My thought is that to keep the house from looking chopped up, as it does now…should we go with ONE color for exterior AND trim? I was thinking a dark grey to contrast with the lighter sandstone. OR do you have an email I could possibly send a picture to as it is difficult to explain? My husband is getting impatient with me because I keep changing my mind, but since I have not seen a home like this I cannot get any examples of what would be the right way to paint exterior and TRIM…Help?!! Hi – please contact me through the Contact Us link on the top of the webpage. I am curious what your advice was to Ms. Anderson. We have a similar ranch house built in 1949 with light sandstone exterior and steel Fenestra casement windows that are currently painted a light trim color. Everything is monotone and the windows blend. I want these fabulous windows to stand out but not make the house look “choppy.” We are restoring all of the windows (no replacement windows here!!) and painting both interior and exterior a dark bronze. I do not have wood trim as most of the exterior “sash” is the sandstone wrapped around with a concrete ledge. I am assuming I paint the entire metal “frame” bronze? Obviously the sandstone and concrete stay as is. We will also replace the old aluminum storm doors with dark bronze as well. And maybe paint the garage door the same color? It is a rambler really with an attached garage. Any advice is appreciated as we start the project next week. Sounds nice! Yes just paint your windows only the bronze. As for your garage door, the wood trim around the door gets painted the trim color and the door can be painted the bronze or the stucco color on the body of the house. It depends on how much you want the garage door to stand out. Good luck! I am restoring a small 1939 Spanish-style home in San Diego. The sash channels have been partially stripped with a heat gun but look terrible (mix of nice bare wood with patches of lead paint remnants). I have read much about leaving channels bare with wax… Is there an easy and safe way to finish cleaning the channels or do you have other recommendation (paint them?). I do not have heart set on bare…just wanting to nicely restore these windows properly. I wouldn’t worry about making them look perfect. A little paint residue is fine. No shortcuts that I know of. We just installed new window with new PVC window casing. They are both white and will remain white. I also have a larger molding on the top of the windows. My question is when the painters paint the windows white again should the sides of the windows that are perpendicular to the house be painted white or taupe like the color of my house? This is the part of the side of the window that protrudes out from the house. PVC windows and casing? Sounds awful. If your window sashes are white then the window casing and trim should also be painted white. I am loving your blog and learning so much. I am beginning to work up a plan to take advantage of a local blight initiative and restore abandoned historic houses in my area, but want to be authentic in my restoration, so I’m taking time to learn rather than jump in and make mistakes that will only make things worse. We have also recently purchased our own 1910 folk Victorian, which has had many modernizations and updates. Is there any way to “make the best of” 1 over 1 vinyl replacement windows? We can’t afford to replace them without getting way underwater in terms of our home’s value, but I would very much like to restore the home’s original appearance as much as we are able, until we can afford more historically accurate 6 over 1 windows. Our first step in restoration will be attempting removal of the aluminum siding from the lower half of the house and I’m very unsure how to address the replacement window casings, since the windows will remain. Fortunately, the upper stories have wood casings intact, as the original cedar shingle siding was left uncovered. They also boarded up the kitchen door from the wrap around porch and covered it with painted plywood so they could frame in that space in the kitchen as a pantry. We are obviously weighing the investment in a more complete restoration with a “good enough” approach that won’t bankrupt us but will be less tragic than plywood. Regarding the painting scheme for the case and channels, I agree that the case should be painted the same as the trim. However, is it worth considering to not paint those specific channels? Just leave them with as bare wood but oiled etc.. Or if one uses say spring bronze for weather stripping the sashes, just run the entire spring bronze from top to bottom in the channel? This would avoid any need for painting the channel and the window would run on the bronze easily in the entire channel. Over time, the bronze will darken or age, giving a what I think a good look Thoughts? You are right. What you state is the best way to do it. I love this site. Thank you for all you do. I have an old Victorian house that has not always been kept up by previous occupiers. I am attempting to save and restore old windows and storm windows with layers of paint. However, the casing is not wood, but aluminum, as is the siding, which I am not going to remove for various reasons. The rest of house, porch, eaves etc. is wood. 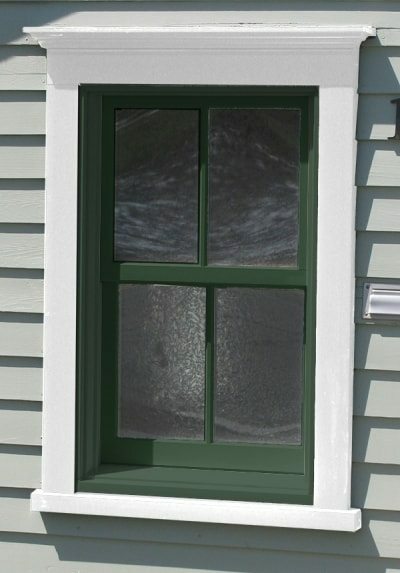 I understand about painting the storm windows the same color as the sash, but do you recommend painting the aluminum casing, which is currently white, and which I want to change to cream, as per all the rest of the trim. I will eventually also paint the siding, which is faded green. (I was thinking of rust or wine for the sash/storm windows, fyi) Any advice you can give would be much appreciated. Yes you can paint the aluminum casing. Cream will look much better than white. A nice window sash color is Sherwin Williams Rookwood Red 2802 or Benjamin Moore Cottage red. Use gloss or a semi. Thank you so much. That’s a great suggestion, and I do like those colors. I really enjoy your site and the information is so helpful; I wish I owned a much older home. I don’t own a particularly old home, but we have “1 over 1” wood windows with large sills in a brick ranch. 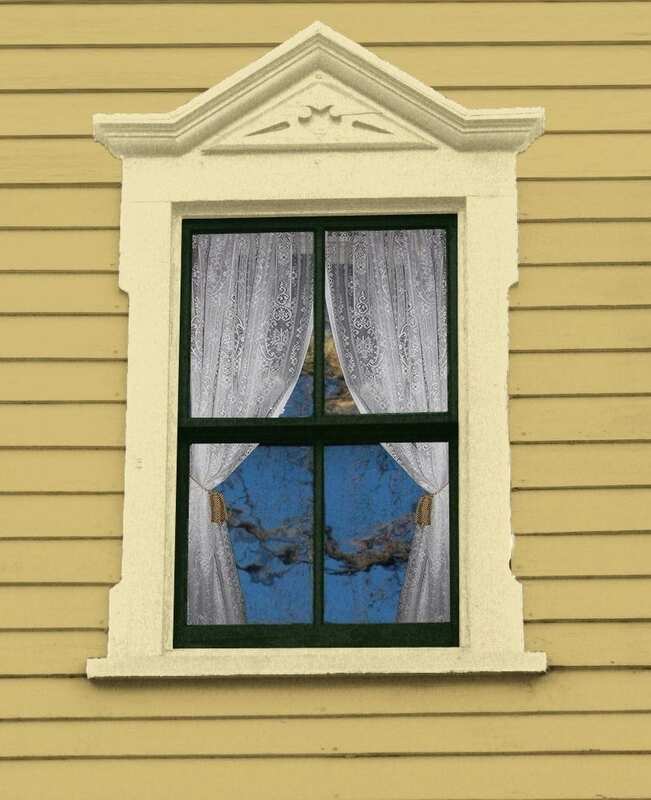 I really want to paint the sash and the casings two different colors, but I don’t see a lot of examples of windows in brick, so I’m unsure if this is the right move? Half of our windows and trim are painted white from the previous owners (which make the house look bland) and half are painted a dark blue/black (I like the color but it falls in the too heavy/weak looking scenario, I think). Any advice would be greatly appreciated. Hi Andrea – I do not recommend having the sash and brick mold around the window different colors on a Ranch house. That would be a bit too fancy. What I do recommend is to replace all the white – meaning everything that is not brick (except the glass of course) Benjamin Moore Manchester Tan HC-81. This color is a nice soft tan that works great with brick and stone. You are a wonderful resource! I came across your articles while researching sash replacement for a 1940’s rock masonry tudor. I’m getting mixed messages from vendors and really wonder if they understand my questions or just trying hard to make a sale that might not be right for our house. I currently have 1 over 1 hung windows with exposed sloped concrete sills vertically below the wood sill of the window. Old screens provide the divided pattern. However, I’d love to see casements with a divide light pattern in this tudor style house. 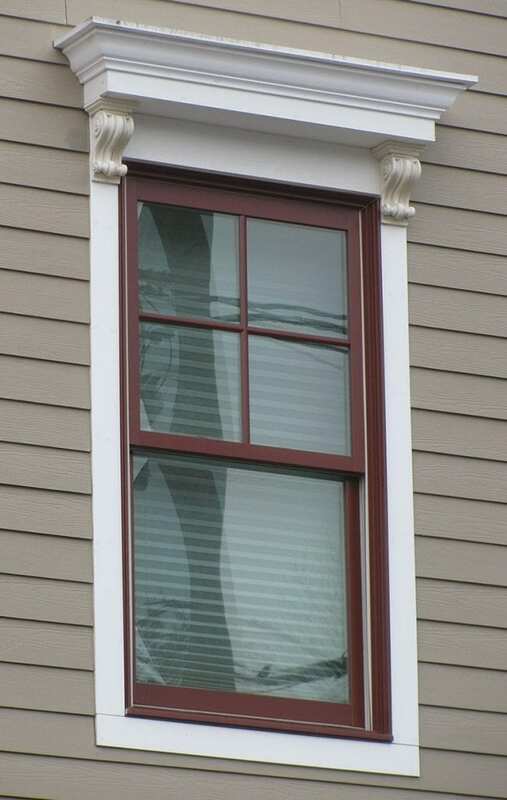 One Window manufacturer (Lincoln) says casements would require a full window replacement including new jambs. That makes sense. Their sash replacements for double hung windows are installed from the inside and seem minimally evasive allowing us to keep as many good components of existing windows as possible. Do you know much about Lincoln Windows? Another Window manufacturer (Sierra Pacific/Hurd) says they can install a casement in the existing frames because their installation is done from the outside. However, I think this proposal is just inserting an entire window casing into existing frames (I fear something like your warnings about Pella Wood Clad replacements). I’m not sure how this will trim out with existing sloped concrete sills. Any advice is welcome. Thank you! Hi Dawn – not familiar with those window manufacturers. You’re best keeping your original windows. You may want to look into Heirloom Windows. Correct – screens match the sash. Is the two-toned look appropriate for the interior, or is this just for the exterior windows? We recently purchased a home with faux-woodgrain windows and wood(toned) trim. We are considering painting the wood trim and the faux-wood casings white, but need to leave the sash as-is, since the crossbar pieces are between the panes of glass and cannot be painted. 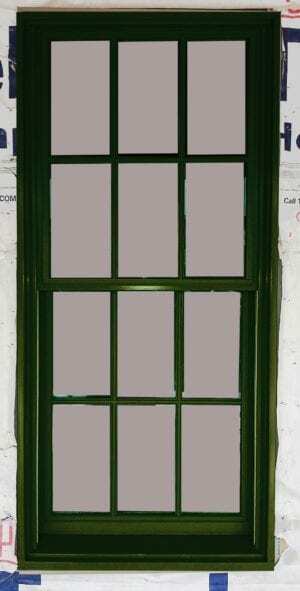 Hi – I would keep the interior of the window (sash and casing) just one color. but putting up storms on second floor NOT fun. Thank you for all your painting tips. My notepad is full. I don’t have them but interior storms seem great. I am ordering new double hung windows to replace existing windows in my 1927 brick bungalow. The frame with brick mould will be wood so that we can paint the frame the same color as the exterior brick. The sash will be clad black. The manufacturer is asking if I want my jamb liners (tracks) to match the frame or sash. I cannot paint the jamb liners so the jamb liner would not match the painted frame. Should the jamb liners match the black sash? No. I guess I didn’t explain myself enough or have enough examples – that is the main point of the post. The jamb must match the trim color. I don’t know how else I can explain it or what more I can say. Please re-read the post slowly. I sincerely hope you are not replacing your original windows and ruining your house. Finally, someone who has explained why all these black windows going into new construction homes just look wrong!! Thank you, and do you know of any brands that offer a white jamb or casing with a black sash? Any idea if the Anderson 100 fibrex material is paintable? Small budget but I notice alllll the details. Wish me luck, thank you. I don’t know about fibrex but vinyl is paintable. You can use regular paint if using a light color. For a medium to dark color you would need to use a paint formulated for vinyl. It has reflective properties in it to prevent warping. Just ask your paint store. Alf Goodall had my same question, but your answer was not clear. 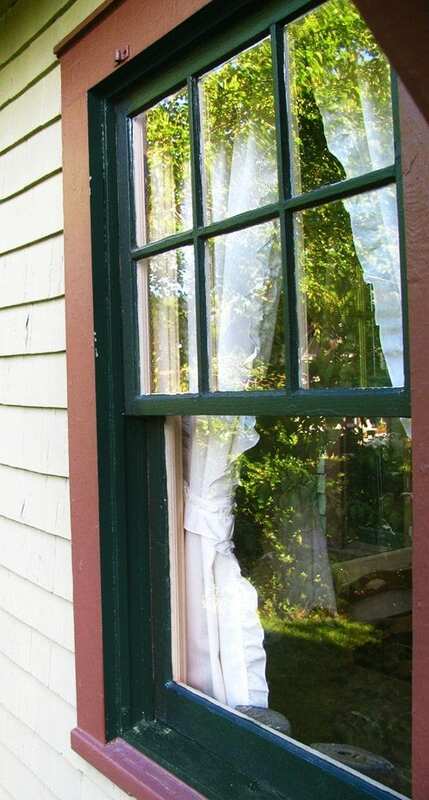 The interior and the exterior sides of a storm window are normally both painted the color of the sash. However if you prefer to have the storm window side that faces the interior painted the color of the interior side of the sash I see no problem. Thanks for all the great advice on windows. I too am a promoter of maintaining old windows rather than simply replacing them every X years. Unfortunately I have vinyl windows in my almost 100 year old house. They just look so out of place. Since the weight pockets are full of expanding foam, and I needed to do something about these old crappy vinyl things, I opted for Marvin Integrity series. Reason is price vs aesthetics. This line has wood on the inside and fiberglass on the outside which is paintable. But the jams are not. I have walked my neighborhood of old houses and the number of houses covered with vinyl with vinyl windows is astounding. Was looking for ideas for my house and could find very few. Now I’m searching the web endlessly for ideas as I restore this old house. I came across this link that has a few pics of new windows with the trim painted the same color as the sash. Not the best option but it doesn’t look all that bad. Well, the lesser of two evil’s I guess. The manufacturers show them that way because they don’t know any better. I wonder if they can make them (color them) the right way. Thank you for awesome site ; you know everything about windows and I honestly know nothing… So maybe you can help me … We recently purchased our first house. It has really good Andersen windows installed through including sliding patio door. What I do not like about these windows is the wood stain inside , I think it darkens the interior and looks like 70ties … Can interior windows stained frame be painted white? The guy who does some home repairs for us tells me it is too complicated and costly job..
Also doors currently are wood stained too ; should all doors be painted white to match the windows interior ? Hi Leah – I usually advise people that if something is natural wood to keep it natural. If natural the wood you have must be of good quality worth showing the grain to appreciate the beauty of natural wood. Cheaper wood is always painted. Today white wood is the trend but history tells us that the white wood popularity will not last long and natural wood will be popular again. Then it’s very difficult to go back to natural wood. My advise is to keep the natural wood for it is timeless and will once again be trendy. If you really need to paint then you will need to remove the varnish. If you paint over it the wood will eventually peel. The best method is to use a paint and varnish stripper, then sand down the wood, prime and paint. If all the woodwork including the windows is painted you can still keep the doors natural. Good luck. Great info! Im currently restoring the original windows in my 1932 English Tudor. They are steel casement windows with muntins & transoms above. I cant tell you how many people have told me to replace them over the years because of energy inefficiency but im glad I didn’t. I so believe like you do that the original windows are beautiful & can be restored. The French black casement window look seems to be so in vogue now too . The painter used a paint stripper to take off all the old coats of paint on the interior windows to bring them down to the original steel. We put anti rust metal primer on them & now we plan to paint them. Is a rustoleum protective enamel oil based paint the way to go? What exterior window paint colors are true to this home? Black? Dark Bronze? Can I just leave the exteriors with the rust primer on them? Any info would be so appreciated. Hi – never leave primer on anything for an extended period of time. It is not designed to protect and hold up. It is designed to create a bond to what it covers and what will be on top of it. I like black gloss windows on a Tudor. The black stands out nicely from the brown timber and really looks elegant. Rustoleum is good to my knowledge. Awesome post- this is a red pill for many I would say. You cannot go back to the old way of seeing windows improperly, life changed. On my project/home it is a mid century modern ranch @ my59ranch.com. I don’t have a full gallery up just yet – but in some of the pictures you might see the issue. The front side of the house has traditional window slats. They are somewhat odd looking cheap windows that will need to be replaced. These windows are in contrast to the other side of the house which are full sized picture windows and modern casement. Since we live on a hill above a lake, it makes for great viewing. But it feels a little odd in my opinion. Any thoughts on meshing two styles and design? Hi Joe – I like how your house looks with the windows in front. While you cannot see two sides of the house at once to know the windows are different they really should match. I would say that being on a lake makes it ok in a way. Hi, we are about to embark upon a window project. Should the interior and exterior mullions of the same window be painted the same color? No – the interior muntins should be painted to match the rest of the trim in the room.